november 2008 | 304 blz. 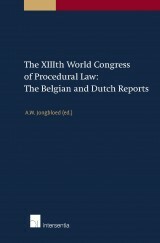 From 16 until 21 September 2007 the XIIIth World Congress on procedural law was held in Salvador de Bahia, Brazil. The congress was dedicated to the theme `New Trends in Procedural Law” and was organised by the International Association of Procedural Law.